I established Tara Skin Clinic in 2012 located in Soham in Cambridgeshire. I am a fully qualified specialist skin health practitioner acquired the international accredited qualification in aesthetic practice, HCertBT (VTCT), MBA and fully insured that can provide clinical aesthetic, non-surgical facial aesthetic procedures, advanced facials, skin care and the most advanced skin improving treatments. Advanced Skin Therapies can transform the look and feel of your skin. They work at a much deeper level within the skin than cosmetic traditional beauty facials. They boost collagen and hydration resulting in fewer wrinkles and a much healthier, youthful complexion. All of my facials are bespoke. I decide after the full consultation which products and techniques will suit your skin best. By incorporating the information from your skin consultation, I will select the products to use on your skin, and the technologies to enhance the results. I offer a customised approach to skincare that is perfectly designed to help you get the best out of your skin and understand how your skin behaves. Many factors influence our skin including diet, our lifestyle, stress, sun exposure and what we use on our skin. I understand how most of us want to have a healthy skin and maintain its balance. I am one of the UK's first and few level 4 qualified in advanced skin practice and an Eve Taylor skin profile analysis specialist. 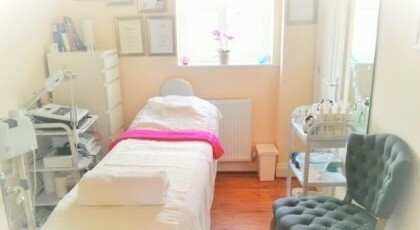 I am not a beauty therapist, I am an experienced skin health practitioner, with a passion for skin health improvement. I have developed my specialist facial treatments, combining latest in skincare science, with carefully selected brands and products, technology and holistic approach to optimise the result of your skin treatment program. If you have any skin complaints such as ageing, lines, acne, acne scarring, oily or dry skin, hyperpigmentation or others, I will review related factors in depth and also if there is an imbalance in your body could have caused it. I will make sure I will support you through the journey of your skin improvement from the beginning to obtain a result and maintain. I have genuine passion about the skin health and I have been very lucky to be able to continuously develop my knowledge by attending the best training, reading about skin and science behind it, skincare products and regularly attending most aesthetic seminars and exhibitions for latest updates. I believe that continuous professional development is essential, in order to bring clients the latest treatments and to keep abreast of current trends. Most importantly I have to admit I have had a great support and encouragement from the most ethical and unique skincare manufacturer "Eve Taylor", and her wonderful team, and my other carefully selected pharmaceutical brand and mainly all of my loyal clients. You will benefit from expert advice on a range of skin conditions and suitable treatments. At Tara Skin Clinic we help improve the appearance of acne, acne scars, pores size, skin general tone and texture, fine lines and wrinkles. We have an exciting passion for facial skin treatments and skin concerns including skin rejuvenation, hyperpigmentation, skin tags, blood spots, facial thread veins, milia, seborrhoeic keratosis, sebaceous hyperplasia, spots, age spots, sun-damaged skin, skin tightening, skin firming, anti ageing, wrinkles treatment, acne scarring treatments, eczema, rosacea, blemishes and stretch marks. We use technologies and clinical aesthetics including, microdermabrasion, chemical peels, non-surgical facelift, dermaroller TM (micro-needling, medical skin needling, Collagen Induction Therapy), Advanced Cosmetic Procedure for non-surgical skin blemish removal, Mesotherapy, bespoke facials and hydradermie treatments. Our aim is to offer you our expertise with the most effective performance skin treatments using natural products and technology. With our extensive knowledge, you will not just receive the best service from initial enquiry right through to our comprehensive aftercare but you will achieve the best possible result. We research and maintain the most technologically advanced equipment and innovative skin care products. We provide you with the best possible prices without compromising on the quality of our services. We have the treatments on ourselves to see the amazing benefits and maintain the healthy looking skin. If you feel we haven’t provided enough information for your enquiry, we would be more than delighted to hear from you in order to answer your questions. Tara Skin Clinic is based in Soham near Ely, Cambridge, Newmarket, Mildenhall, Cambridgeshire, Suffolk, and Norfolk. - Qualified specialist skin health practitioner- HCertBT (VTCT), accredited qualification in aesthetic practice by Ofqual and aligned to the qualification standard within Health Education England (HEE) framework. Skin Clinic in Soham Cambridgeshire near to Ely, Newmarket, Red lodge, Mildenhall, Littleport, Downham market, Cambridge, Fordham, Snailwell, Burwell, in Cambridgeshire, Suffolk.